As I mentioned yesterday, I’m a sucker for New Year’s resolutions. I also find the first day(s) after winter break incredibly hard to engage students and get them to focus on our normal content. I think we all need to “ease in” a little. With that in mind, this year I put together a short New Year’s goal-setting and a 30-Day Challenge Extra Credit Assignment to use in my classes. This was a great way to get my kids talking and writing again as well as thinking about their long-term plans and tangible steps they can take to get there. The whole “lesson” took about 45 minutes – which was the perfect way to ease back in before reviewing grammar and distributing a new novel – and everyone seemed to enjoy it. I started by polling the class to see who had made New Year’s resolutions this year. To be honest, I was shocked at how few students actually did. 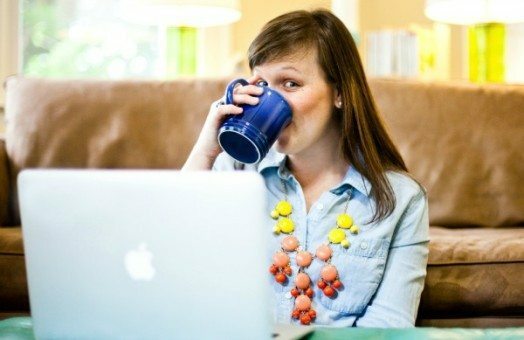 (Apparently this isn’t nearly the trend among teenagers that it is among 30 something mom-bloggers. Who knew? 😉 We talked about why people make resolutions at the beginning of the year, and what keeps people from following through with resolutions. I also had a few volunteers share about a time when they did make (and stick to / see a real change from) a resolution in the past. 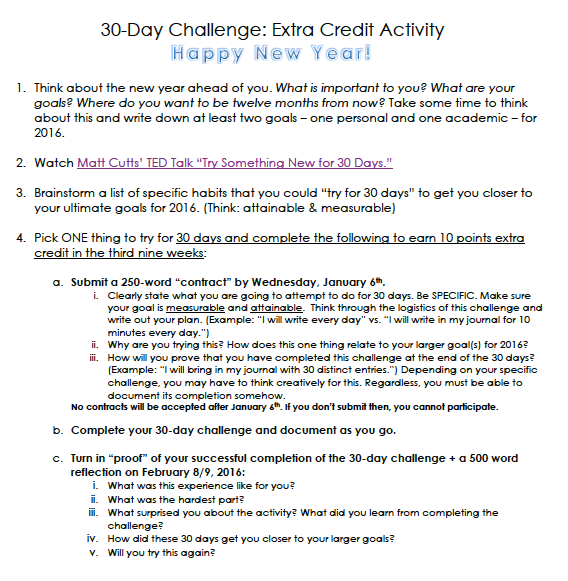 Finally, I handed out the above extra credit assignment and challenged the class to join me in spending 30 days committed to something. Interested students must turn in a 250 word “contract” outlining their goal and the logistics as well as its importance and relevance to their larger goals next class. Then, after completing the challenge successfully, they will submit a 500 word reflection essay at the conclusion of the challenge to earn 10 points extra credit on the next quarter. Do you do anything special with your students to kick off the new year?!? I teach a once a week Values class at my school to third graders. I might do a modified version of this. I want to start by thanking you in advance. I unloaded to you once last year, and you created a post that replied to MANY of my issues/questions. I have a feeling that you will do the same for this one because 1) you remember what it’s like to be me 2) you are quite honestly an amazing e-mentor, and I know you will feel called to help me even though you like .02 seconds of free time. 1. Just started teaching all higher -level courses this year (honors 9th and 10th) instead of on-level. I have MANY students who are just smarter and more intelligent than I am. There’s about two of them who know it, and they’re in one class together. I know that most of my feelings and issues stem from my own insecurities. I know I stumble over words and can’t figure out how to say what I am trying to say because I see them smirking and making fun of me (even though it’s the last period of the day, and I’ve taught the class already). And, I know that it says more about them than it says about me – that they think they have nothing to learn from those who are not smarter than or as smart as them… but do you have any other advice to get through/deal with this? 2. I’ve been teaching new preps every single year for the past three years. I cannot wait to teach the same course two years in a row. With that being said, every year, I feel like I am learning new texts and content the entire year (every night I am reading ans prepping just for the next day to stay ahead) just so I can teach my students the next day. I. am. Exhausted. And, I feel terrible saying that because I am not even a mom lol. Do you have any tips to make this process easier? Also, how do you generally introduce/give background information when starting a new novel? I know it depends on the novel and content, but any tried and true methods that really gets students engaged? This is such a fun idea! I teach science and we have a state test at the end of the year so I find it hard to have too much time for more fun things like this. It makes me wish I taught something a little more exciting…but anyways, we did have a chat about the best things that they did over break and I at least let them get some of their energy out before we jumped right back into cells.